An overall shot of Ralph Wilson Stadium before the Buffalo Bills’ game against the New England Patriots last September. The Buffalo Bills’ franchise will be placed in a trust following the death of owner Ralph C. Wilson Jr., and no quick sale of the team is expected. In fact, the trust is likely to control and manage the team for at least a couple of years before any sale of the team is arranged, both team and National Football League sources tell The Buffalo News. The death of the Bills’ 95-year-old owner Tuesday means the team eventually will be put up for sale by Wilson’s estate. That was the plan Wilson laid out decades ago and one he vehemently stuck to in recent years as local worries about the future of the franchise increased. Having a trust in control essentially keeps Wilson’s management team in place for the near future. Could the trust operate the team for more than two years? Yes, according to sources close to the Bills. Ultimately, however, Wilson’s estate will have the fiduciary responsibility to take roughly the best offer it can get for the franchise. The Bills are not in immediate danger of leaving Western New York, due to the long-term lease that exists among the team, Erie County and New York State. That lease runs through 2023, and the team would have to pay a $400 million penalty to get out of it, with one exception. There is an out clause in the lease that would allow the team a one-time option, in 2020, to buy out the final three years of the deal for a payment of only $28.4 million. It’s presumed the team will be sold before 2020. 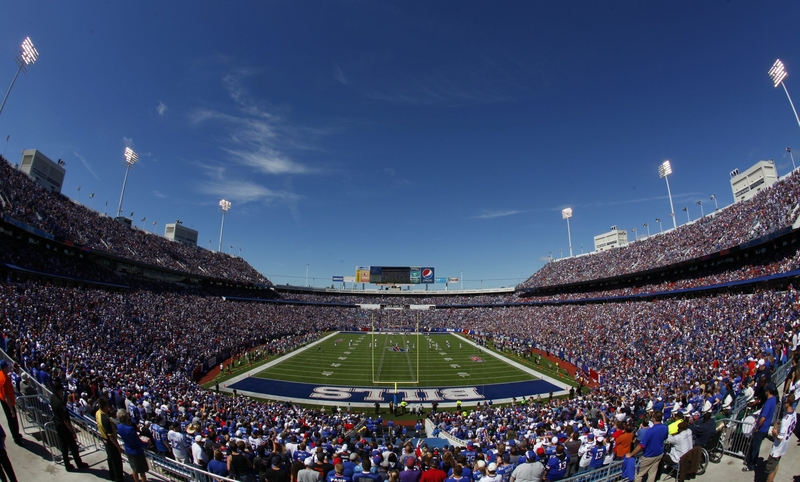 Bills fans hope that sale will be to a group intending to keep the team in Western New York. Besides the penalty to break the lease, there would be at least one other major complicating factor if a group that bought the team wanted to move it. The sale of any team must be approved by three-quarters of the owners – 24 of the NFL’s 32 teams. NFL Commissioner Roger Goodell, who was born in Jamestown, has said he thinks the Bills can remain viable in Western New York as long as the team has a suitable stadium. And he has said he would like to see the Bills remain here. It is common for a trust to be established to manage a big business after the sole owner of that business dies. By law, a trust is a relationship whereby a property (in this case, the Bills) is held by one party for the benefit of another (in this case, Wilson’s heirs). Longtime Bills treasurer Jeffrey C. Littmann, 59, is one of the executors of Wilson’s estate, and he will be part of the decision-making team in charge of overseeing the sale of the team. It’s believed there are one or two other executors in addition to Littmann. Savino, a business attorney, said what happens next will depend on the exact instructions set up by Wilson. While the trust is running the team, Littmann remains treasurer, Russ Brandon remains Bills president and chief executive officer, and Mary Owen, Wilson’s niece, remains executive vice president in charge of strategic planning. Wilson did not want to leave the team to his wife, Mary Wilson, or to his two surviving daughters, Christy Wilson Hoffman and Edith Wilson. Prospective owners now can start lining up to purchase the Bills. Los Angeles poses the biggest threat to lure the team away from Buffalo. It’s the nation’s second-largest city, and it has not had a team since the Rams and Raiders moved away in 1995. The NFL would like not just one, but two teams in Los Angeles. Los Angeles has been trying for almost 20 years to finalize plans to build a suitable stadium as home for an NFL franchise. Toronto is another threat to woo the Bills, but probably not nearly as great of a threat as L.A. While the Bills have played games in Toronto since 2007, the city still does not have an NFL-caliber stadium, and the team canceled the Toronto games for the upcoming season. Furthermore, a team in Toronto would do nothing for the NFL’s television ratings in the United States, and that is the No. 1 consideration to the league’s 31 other owners in terms of the value of their franchises. There are expected to be numerous bidders seeking to keep the team in Buffalo. One potential buyer is Sabres owner Terry Pegula. He has a net worth of about $3.1 billion, according to Forbes magazine. Pegula has said he might step in if it looked like the team was in danger of moving. Another is B. Thomas Golisano, who bought the Sabres in 2003 to prevent the team from leaving town. He later sold the Sabres to Pegula. Golisano also has said he would be interested in buying the Bills if it looked like they were going to leave. “The higher the concern, the more interest I probably would have,” Golisano told The News in February 2011. Golisano had a net worth of $1.9 billion in 2013, according to Forbes. Another person who has expressed interest in purchasing the Bills is Jim Kelly, the Hall of Fame quarterback, who said he wants to be part of the franchise’s next ownership team. Kelly has had a long-standing relationship with several billionaire bidders who could make a run at the Buffalo franchise. But the recurrence of Kelly’s cancer adds uncertainty to that scenario. The last NFL team to be put up for sale after the death of its owner was the St. Louis Rams. Owner Georgia Frontiere died Jan. 18, 2008, and the team was sold in August 2010. That sale process was lengthened by the fact an economic crisis hit right about the time of Frontiere’s death, and the bottom fell out of the lending market. It took longer than expected to line up acceptable terms of a sale. When it comes time to sell the team, another big question will be: Will a majority of NFL owners want the team to stay in Buffalo? Any bidder for the Bills seeking to move the team would have to be willing to pay a relocation fee. There has been a lot of speculation in Los Angeles that the fee could be $200 million or more. The fee is whatever the NFL owners want it to be. Of course, the value of a franchise in Los Angeles would be far greater than the value of a franchise in Buffalo, maybe even double. So it’s uncertain how much of an impediment a relocation fee would be to moving the team from Western New York. News Staff Reporter Denise Jewell Gee contributed to this report.